From the first three notes of “What Are You Doin’,” you know this is a Michael Burks record by the Iron Man’s guitar playing. 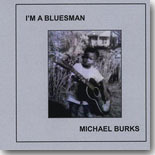 The record, I’m a Bluesman, is a 1998 recording Michael made at Kingsnake Studios that sat in the archives of Wightman Harris for a number of years. Michael’s widow, Bobbie, decided it needed to see the light of day and be heard by Michael’s fans world-wide. I’m proud of Bobbie for her determination to get this project off the ground, and am very happy to have some new music by the Iron Man to listen to. Time to share it with y’all. Michael’s problems with love continue in our next track, a condition he refers to as “Love Disease.” “Call my doctor…doctor, can you help me please…well my doctor told me…he can’t cure the love disease.” Unlucky in love again, Michael is working through the pain it’s causing him and hopefully he’ll manage a complete recovery. It doesn’t matter who he calls for help --- his doctor, his mother, his preacher --- none of them can provide the cure for what ails Michael most, his love disease. I have to admit that Michael’s cover of the Hall & Oates tune, “Sara Smile,” surprised me but it’s probably my favorite song on this disc. Michael’s a big teddy bear with a heart of gold, and the love he expresses in “Sara Smile” is real. “When you think you can’t go on…I’ll come and hold you…it’s me and you…forever….Sara, smile.” Beautifully done and I can see Michael in front of his microphone serenading a rapt audience that he’s holding in the palms of his hands. Michael’s incendiary guitar returns in a tune written by Lou Pride, “I Didn’t Take Your Woman.” “If you hadn’t been good…or good to her…treated her right…she’d still be there…right back with you now…instead of in my arms tonight…let me tell you, I didn’t take your woman…you gave her to me.” A woman treated badly will always look for the arms of a man who wants her most and Michael’s proof of that here. Michael’s not a man that can be fooled easily and he tells his woman that in a tune he wrote with Bob Greenlee, “You Ain’t Slick.” She calls in sick to work, dresses to go out to play and Michael says it best, “You ain’t slick…I know every move you make…and you ain’t that quick.” This one isn’t long for Michael’s affections and I’m sure she’ll see the door before too long. I hear some horns in the background of our next track, “Blues Will Never Die,” and Bill Samuel’s arrangement for the horns is impressive. “If your love for me is dead…you know the blues will never die.” Michael loved the woman in question and his heart will grow heavy and endure the pain of her leaving his life for a long time to come. You can pack up the pictures, removed all of the reminders of what was…but your memories will haunt you…”and the blues will never die.” “My Little Girl” is a beautiful ballad of Michael’s that shows the importance of his child to him even while his relationship with her mother is falling apart. “I know that it’s over…life goes on without you…now you found another…you doing what you gotta do…now I live beside your world…oh, but I need my little girl.” His little girl is everything to Michael and he will do whatever he has to…just to keep her in his world. Michael continues to be unlucky in love and he covers his significant other’s infidelity in our next cut, “Games Two Can Play.” His fretwork continues to echo the sadness he feels at being deceived, but he’s up for the challenge of moving on as he sings, “I asked about your new man…you say he’s just a friend…two can play this cheating game…baby, I’m on my own dear.” Michael was a blues man through and through, a topic he covers in “That’s What I Am.” “Just like bacon and eggs…just like ham…on rye…that’s me and the blues…I’m a blues man…til I die.” Indeed my friend, you definitely were a blues man until the day you died and we miss you to this day. The record closes with another tune written by Michael, “Raised Up In Arkansas,” celebrating the land he came from. “I was born in the water…raised up in Arkansas…oh, about the age of two…I started playing my guitar.” Michael got started at an early age and left us way too early but I’m grateful for his time on earth and the friendship I shared with him. My hat’s off to Bobbie Burks and Wightman Harris for bringing this labor of love to fruition. It’s a stellar recording that can stand toe to toe with anything ever released by Michael and a fitting tribute to the Iron Man and all he stood for to Blues fans worldwide. I’m sure this will never be a disc with great distribution, so I encourage anyone who was a fan of Michael to go to his website, www.michaelburks.com, and grab this treasure for yourself. You’ll be glad you did.